Democrats were swift in their criticism of the decision to release the memo. Reaction across Capitol Hill to the controversial memo compiled by Republican staff on the House Intelligence Committee was swift. Democrats harshly criticized the decision to release the memo, which President Trump authorized Friday morning in a letter relayed to the House Intelligence Committee. The memo details the process that led to the court-approved surveillance of former Trump campaign adviser Carter Page, a suspected Russian agent. What do we know about the secret GOP memo? Rep. Adam Schiff, D-Calif., the top Democrat on the House Intelligence Committee, wrote in a statement Friday, "Chairman Nunes' decision, supported by House Speaker Ryan and Republican Members of the House Permanent Select Committee on Intelligence, to publicly release misleading allegations against the Department of Justice and Federal Bureau of Investigation is a shameful effort to discredit these institutions, undermine the Special Counsel’s ongoing investigation, and undercut congressional probes." Sen. Mark Warner, D-Va., the top Democrat on the Senate Intelligence Committee, called the decision "reckless and demonstrates an astonishing disregard for the truth." "This unprecedented public disclosure of classified material during an ongoing criminal investigation is dangerous to our national security. This will make it far more difficult for the Intelligence Committees to conduct meaningful, bipartisan oversight of intelligence activities in the future. This action was also taken without regard to the damage it could do to our ability to protect Americans from threats around the globe," Warner said. 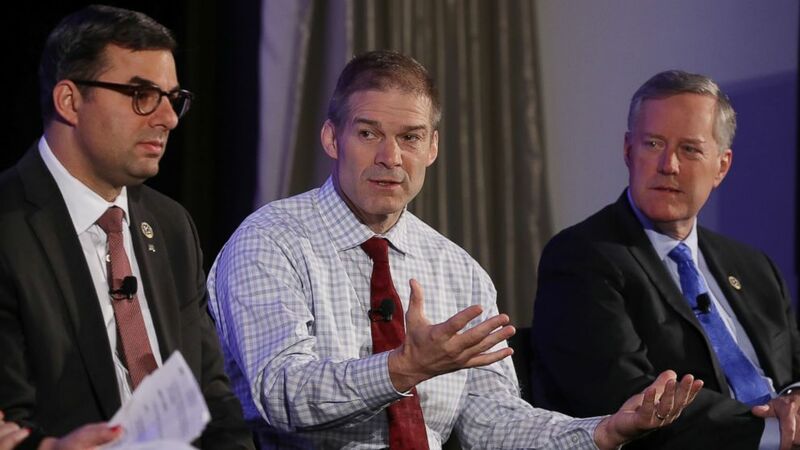 (Mark Wilson/Getty Images) Members of the House Freedom Caucus, (L-R) Rep. Justin Amash (R-MI), Rep. Jim Jordan (R-OH) and Chairman Mark Meadows (R-NC) participate in a Politico Playbook Breakfast interview at the W Hotel, on April 6, 2017, in Washington. Sen. Richard Burr, R-N.C., who chairs the Senate Intelligence Committee, declined to comment on the memo when asked by ABC News. In a letter to President Trump, top Democrats from the House and Senate warned against using the contents of the memo as a rational to fire special counsel Robert Mueller. "We write to inform you that we would consider such an unwarranted action as an attempt to obstruct justice in the Russia investigation. Firing Rod Rosenstein, DOJ Leadership, or Bob Mueller could result in a constitutional crisis of the kind not seen since the Saturday Night Massacre," the letter, sent Friday by both Senate Minority Leader Chuck Schumer, D-N.Y., and House Minority Leader Nancy Pelosi, D-Calif., and other members of the House and Senate leadership, said. Senator John McCain, R-Ariz., also harshly criticized the release of the memo. "In 2016, the Russian government engaged in an elaborate plot to interfere in an American election and undermine our democracy," McCain wrote in a statement Friday. "The latest attacks on the FBI and Department of Justice serve no American interests – no party’s, no president’s, only Putin’s. The American people deserve to know all of the facts surrounding Russia’s ongoing efforts to subvert our democracy, which is why Special Counsel Mueller’s investigation must proceed unimpeded. Our nation’s elected officials, including the president, must stop looking at this investigation through the warped lens of politics and manufacturing partisan sideshows. If we continue to undermine our own rule of law, we are doing Putin’s job for him." 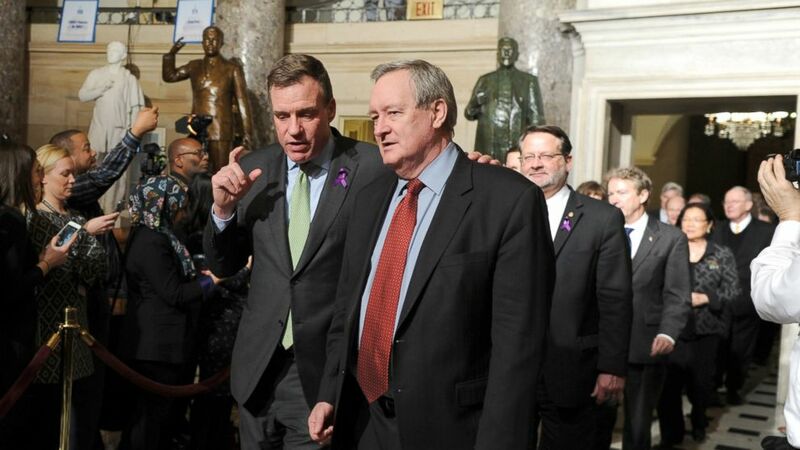 (Jocelyn Augustino/Redux) Senators Mark Warner (D-VA) left,, and Mike Crapo (R-ID) walk through Statuary Hall on Capitol Hill to attend President Trump's State of the Union address, Jan. 30, 2018. Other Republicans, however, defended the decision, saying the information needed to be released to the public in order to ensure full transparency. W/out dossier, there would've been no FISA warrant. Was admitted under oath by McCabe. DOJ/FBI already knew dossier's source was unreliable & shouldn't be used, but filed applic w/it anyways. Waited until after to fire Steele. Then applied for extensions on warrant anyways. Here it is. The FBI took an unverified political dossier and used it to get a secret warrant to spy on an American citizen and political opponents. 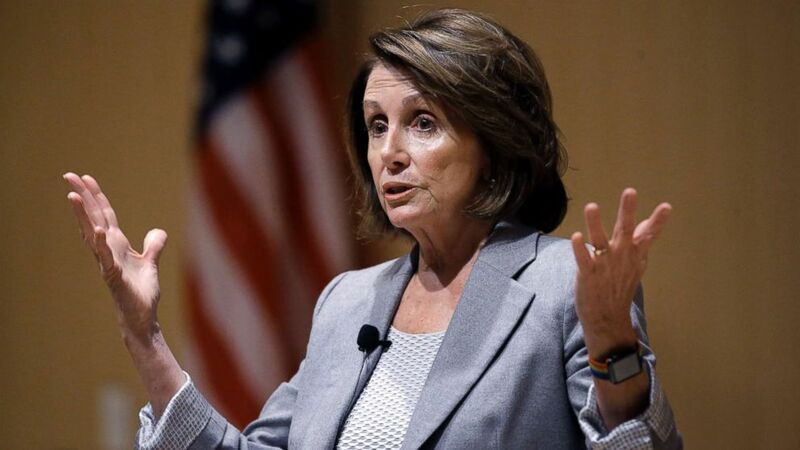 (Steven Senne/AP) House Minority Leader Nancy Pelosi of Calif., speaks during a town hall-style meeting, Feb. 1, 2018, at the Cambridge Public Library, in Cambridge, Mass. Some Democrats expressed grave concerns over the precedent set by the release of the memo. Republicans, like Rep. Tom MacArthur, R-N.J., took a more nuanced approaching, acknowledging the concerns raised by the memo but also urging caution. Allegations in memo are serious, but must not be used to impugn the FBI or discredit the investigation by Special Counsel Robert Mueller. Anytime we talk about abuse of govt, Americans need to know, but we must not allow this memo to become a distraction from work we need to do. Rep. Trey Gowdy, the chairman of the House Intelligence Committee, said that while the memo raises concerns, he still has confidence in Mueller, the FBI and the Department of Justice.